We have had a couple of really good fishing reports in from Orewa over the past week as well as one snag report. Rob at our shop in Onehunga received a report of a very large rope attached to the bottom which is situated directly in front of the surf club. We are not sure what the purpose of the rope is but make sure you give the surf lifesaving club area a wide berth. The photo above was sent in by Craig Landon. 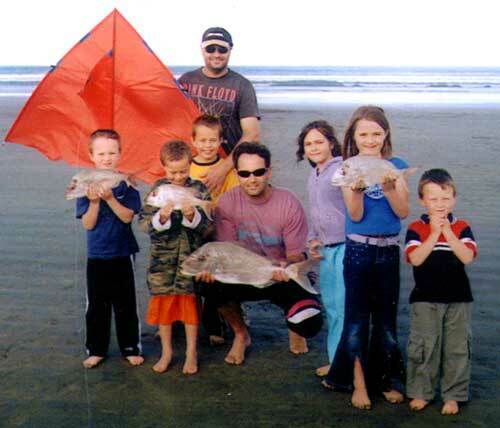 The catch was taken from Orewa Beach on December 8, 2002. Craig was using his bottom longline rig baited with mullet. From one set in the afternoon following an easterly storm they landed 4 nice snapper up to 4.5 kgs. It's great to see the entire family involved in kitefishing. Had a quick trip on Friday down to the Number 10 marker near the end of the airport. It was a pretty typical evening fish with the 25 hook boat longline equipped with one floating bead on each hook. The fish weren't too numerous but the quality was good. From two 20 minute sets we got 2 pan sized snapper, 2 kahawai, a cute bronze whaler and a huge gurnard of 45cm. The fun thing is that with target wires we had no hooks bitten off, no undersized fish and no gut hooking. Phillip Moore of Auckland spent last weekend on the charter vessel the "Kaipara Star". A party of 12 headed out for a days fishing on the Kaipara Harbour for a very reasonable rate of $ 50.00 per person. According to Phil the over all catch for the day was around 60 fish including snapper up to 7.5 kgs. Phil was using the sliding rig technique in conjunction with the new floating bead traces and was totally amazed with the results. Phil and a couple of his mates were using the Target snapper hooks and were not only catching two fish for every one caught by the other fishers on regular hooks, but they were also ALL lip hooked while the normal fish hooks were being swallowed. Phil also reported that because of the sizes of the snapper being caught on the Target hooks, he and his mates were safely returning anything under 40cm back to the sea. Phil's average fish were 45cm to 50cm. There are still good numbers of large snapper being taken along Mokau Beach. Geoff reported that while kitefishing on Monday March 3 he landed 1 very large thresher shark and 3 snapper, 4.8 kg, 5.4 kg and 6.9 kg using fresh kahawai for bait. The following day he caught several school sized snapper and 1 which weighed in at 8.1 kg. Geoff was a bit disappointed however as this broke his winning run at the local pub. The winning snapper was 10.7 kg. According to Geoff the best catches have been taken during the offshore winds in the morning when the seas are slight and conditions are perfect for kitefishing. On Wednesday March 19 we were at our shop in Onehunga and noticed a Flexiwing Rig which Rob was in the middle of repairing. According to Rob the novice kitefisher couldn't quite work out what the line on the handspool was for and wondered why there was no allowance for hooks on the mainline of his dropper rig. Instead of reading the instructions, the kitefisher made an executive decision on the spot and decided to tie blood knots in his mainline for attaching his running traces to, effectively turning his dropper rig into a longline rig. 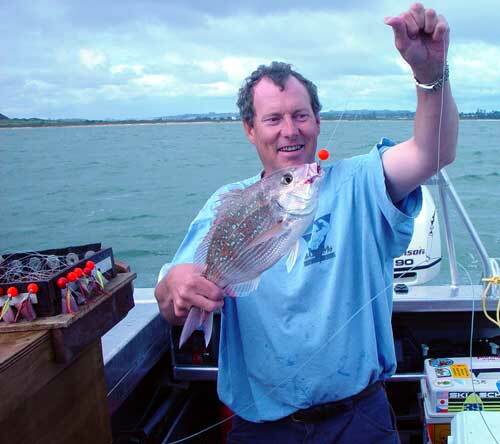 The good news is that the kitefisher did not lose any gear and in fact managed to catch 5 good sized snapper on his Flexiwing Rig from Orewa Beach. The rig is now back to it's original state being a safe and efficient small dropper rig. Editors Note: We do not recommend tying blood knots in the 31 kg mainline of the Flexiwing Rig. These knots weaken the line by as much as 45 %. If you HAVE to tie a dropper knot, check out this one it is much stronger. Several kitefishers have however got a 75kg pre-stoppered hook section which they clip in to their flexiwing rigs so they can run them as a 10 hook longline on the east coast when conditions suit. Kia Ora from the sunny Bay. Such a lovely day on Sunday, out we went to kite fish. We had plenty of practice putting our kites out but no fish. The great thing about Sunday, other than being out fishing, was that there were another 6 kites out there as well. What a sight to see, that many kites out fishing, all at different altitudes and distances offshore. Fantastic! For the record, 1 fish caught from the 7 kites, after 2 sets each lasting about 1 - 1.5 hours per set. Not great, but a great time had. At our place, east side of the Waitakere ranges with a clear view to Coromandel, on Sunday morning the wind was SE blowing a steady 20 knots gusting to 25. Rang the team, daughter and partner in Kingsland, meet you at Westgate 9:00. Got to Muriwai and the wind was SE 5 - 10 knots at best. Drove North and passed a couple of others just setting up at about 5 kms up the beach. We picked a spot where the rip didn't look too bad, wrong! Tried to launch the kite but it kept diving. Must have had something to do with the way the wind was coming over the dunes. Moved South about 2 kms, set up again baiting with mullet and the kite took off with a tack to bring it about 15 degrees offshore. Sent it out with 10 hooks and left it for about 15 mins to fish. Hauled it in and caught 1 small kahawai. Reset the line to about 600 metres and left it a further 15 mins. Next minute the kite did a big loop the loop and crashed! Bugger! I hate it when that happens. Got the kite about half way in and my daughters partner was nearly dragged back into the surf. I rushed back to help him and next minute nothing. We lost our brand new, first time out, pink Delta Force kite, float, kite line, rolling sinkers (in tubing), 5 Jap hook traces, 5 floating bead traces and about 300 metres of line. I think it must have been a large shark. If anyone finds this gear, and I know it's a long shot, but can you please give me a call on 027-439-8239. Ed: Tacking a kite in a south easterly at Muriwai can be very difficult. This is because easterly winds from the south kick 10 to 15 degrees onshore on the coast and the rip normally goes up the beach at the same time. In a south easterly turbulence from the sand dunes is also at a maximum. A northerly wind is much easier to fish at Muriwai because it kicks 10 to 15 degrees offshore at the coast and the rip works to your advantage. The only exception to this rule is when the swell is from a north or northwesterly direction as this can often change the rip direction. The temptation to continue adding weight or drag to one side of the kite to overcome the rip is considerable but not helpful in this situation. I suspect the reason the kite came down was due to over tacking. Kitefishers can really benefit from practising tacking in good clear air in a park. By doing this you can wind up with a variety of tack ropes, tested and labelled for different tacks and wind speeds. This can make life so much easier when you get to the beach. You simply put the kite up with the appropriate tacking rope for the conditions and away you go! Paul and I have fished the main beach at Muriwai in a south easterly but we have never really done well and now we only fish a dropper rig at the top end of the beach in these wind conditions. The following two links will take you to some very useful kite flying information and are well worth reading. Thank you to all those who have contributed to the newsletters so far. If you go fishing, please take a couple of minutes to fill out the form. This lets everyone know where the fish are biting, and where they are not. Don't forget to take your camera when you go fishing and send in your pics. If you are concerned about divulging your exact fishing spot just give us the name of the beach and the area if this is appropriate.